A few weeks ago we decided to visit the World Expo with some friends, on a whim. We took advantage of the 5 euro evening pass and made more of a social evening out of it than anything else as many of the pavilions were starting to close by the time we arrived. We mostly walked around, surveying the pavilions from the outside, taking in the displays, having a bite to eat and watching the ceremonious nightly Tree of Life water, music and light show. This year’s theme is all about food, and more specifically sustainability and feeding the world’s future population without destroying the planet, something that should excite a plant based food blogger and planet conscious individual like me; and while I do admit to having been taken in by the impressive architecture and design innovation on display, not to mention on cloud 9 eating Lebanese food at the Mediterranean pavilion, I was also a bit put off by all of the grandeur, consumerism and to be quite honest some of the exhibitors in the form of big brands who in my opinion have contributed greatly to the planet’s sustainability issues and which I would never consider a form of food. All I could think was how much money was spent on this world fair by the exhibiting countries and brands and could this money have been better spent on actually implementing real solutions for feeding the planet in a sustainable way? I recall an article I once read by Mark Bittman, in which he intelligently argued that feeding the world is not a shortage of food issue, but rather a distribution of wealth issue. He stated that the real issue is poverty and the solution is empowering and enabling underdeveloped nations to harvest and grow their own food as opposed to reducing them to poor labourers who grow food for export. He also pointed out the fact that our food system is all about profit and has very little to do with feeding people and personally, I couldn’t agree more. In many ways my experience at Expo felt like being at an architectural design and innovation show that also gave participating countries an opportunity to showcase their culture, heritage, food traditions and beautiful landscapes, not to mention a huge marketing opportunity for the big brands. I don’t know how much awareness it is bringing, if any at all, to the real issues at hand, that is, all of the suffering, poverty and hunger in the world today and the exploitation of the planet’s resources for the sake of making a buck. Maybe I’m over simplifying this, but I still can’t help but wonder, could there have been a better way to spend all of that money? Could there have been a better way to educate people about the real issues? Could there have been a better way to take action and instigate real change? As I ponder those questions, I’ll present you with this light and refreshing summer soup, perfect for a simple weeknight meal or as a first course to something more elaborate; and I gently remind you to be thankful for all that you have, because chances are if you’re reading this you’re one of the richest people in the world, even though it might not seem like it sometimes. Zucchini or courgette is a type of summer squash that is readily available all year round, but most naturally in season during the warm summer months. This vegetable is rich in Vitamin C, and has modest amounts of manganese, B complex vitamins such as folate and pyridoxine (B6). Zucchini is also rich in phytonutrients that promote healthy eyesight, such as lutein and zeaxanthin, powerful antioxidant compounds that work along vitamin C and manganese to protect against free radicals. Zucchini can be eaten cooked or raw. Here it is combined with mint in a flavourful summer soup that can be eaten warm, at room temperature or cold. 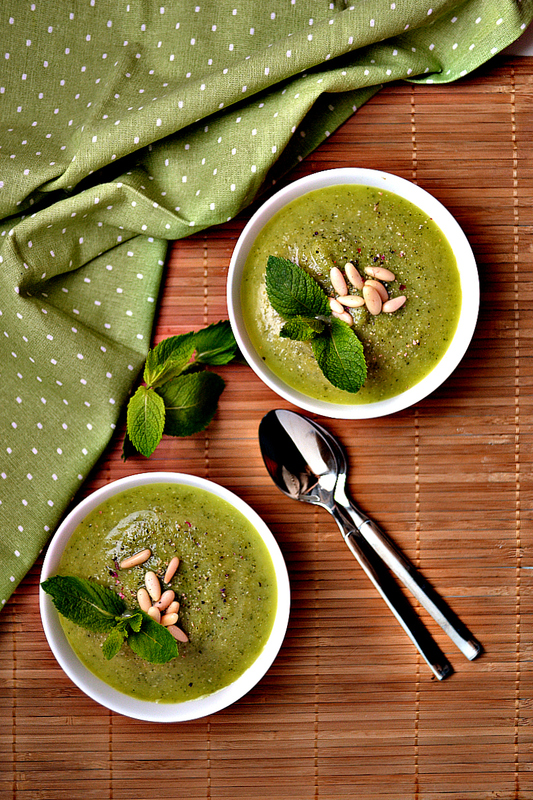 Mint not only adds freshness to this soup but also acts a smooth muscle relaxer to aid digestion. Mint is also a source of vitamin C and manganese. Zucchini are sauteed with shallots and garlic, seasoned with herbamare and cooked in water or vegetable broth and then pureed with mint to deliver this refreshing cooling summer soup that is best eaten at room temperature. It can also be eaten warm or cold depending on your preferences. Sautee the shallot in water or EVOO with a pinch of sea salt or herbamare until transluscent, about 2-3 minutes. Don’t let the oil smoke, if you’re using it, by keeping the heat on medium. Add crushed garlic and sautee for an additional minute. Stir in zucchini slices, another pinch of herbamare and sautee for 2-3 minutes. Add water or broth and bring to a boil then add more seasoning to taste (herbamare or sea salt). Let boil for about 3 minutes, stirring well, then switch off the heat, add a handful of cashews and/or pine nuts, cover and let stand for 10 minutes. 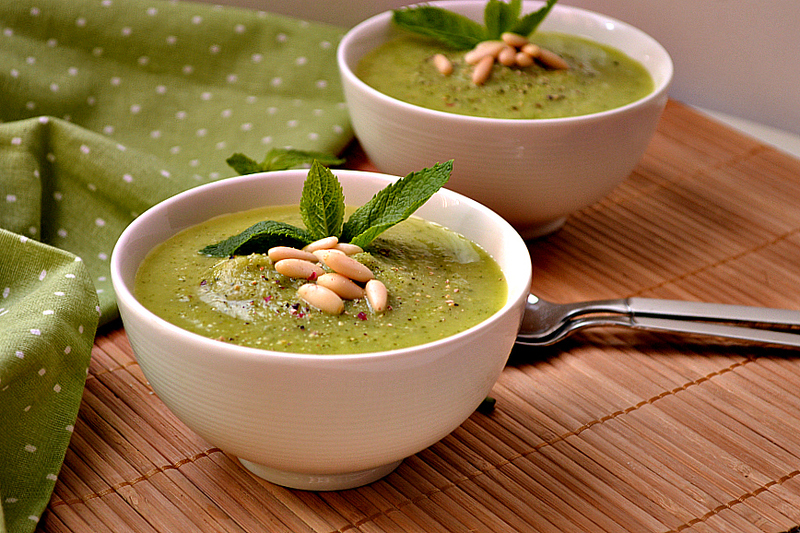 Stir in fresh mint and use a hand blender to puree to a smooth consistency. Let cool to room temperature, top with pine nuts, fresh ground black pepper and some fresh mint leaves and serve. Leftovers can be stored in the refrigerator in an airtight container and eaten cold the next day. This is such a beautiful soup, Nissrine! Never thought to combine mint and zucchini but it sounds magical. And I hear ya on the expo issue — I ponder things like that all the time myself.. Thanks so much Audrey. If you like this, you should have a look at the spaghetti with creamy zucchini and mint sauce.